Most of us know we should eat better and exercise more, but do we? Obesity in the U.S. has nearly doubled since 1980 as our bellies protrude. Just 21% of us get the recommended amount of exercise, the Centers for Disease Control and Prevention says. We know we should make changes, but we resist. Hold that thought. Speaking of change, has any industry undergone more change recently than media? Even prior to repeated attacks on the media from President Trump, digital technology was helping to make printed newspapers anachronistic. More than a few brands have chosen to forego traditional media relations and create newsrooms and publications. Others deploy paid and unpaid influencers and employee advocates to spread the word about brands. Into this environment PR News and its Media Relations Working Group, comprised of 23 media relations and communications specialists, surveyed PR pros during March and April 2018 to gauge attitudes about media relations today and tomorrow. More than 400 responded to questions about the difficulty of obtaining media coverage, the importance (or not) of media relations and earned coverage in an age of social media influencers and brand-created content. The survey also allowed respondents to describe new tactics they've adopted to bolster their media relations efforts. Nearly 300 did. 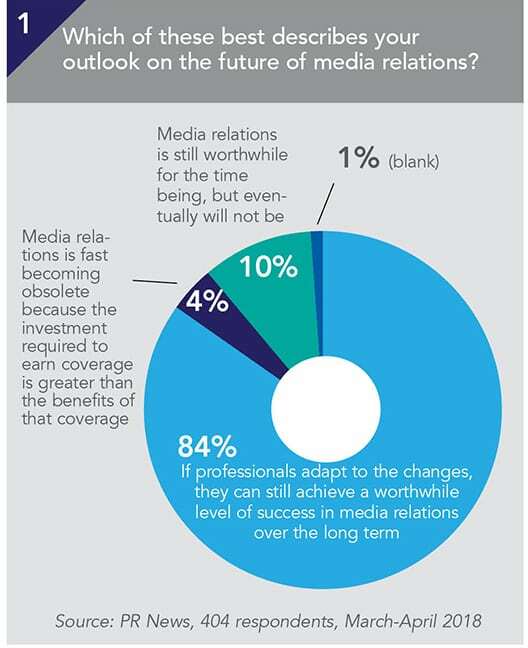 As you can see in chart 1, an overwhelming majority of PR pros (84%) are upbeat about the future of traditional media relations, where communicators pitch stories and other messages to media, hoping it results in coverage. Incidentally, 84% was by the far the largest response to any question in the survey. Note, though, the wording of the response in the survey: "If professionals adapt to the changes" media relations can continue to be a worthwhile endeavor (emphasis ours). Fine, so the message seems to be success is attainable if you change your approach to media relations and pitching in response to the shifts in how journalism works, right? On that score the survey’s results are open to interpretation. 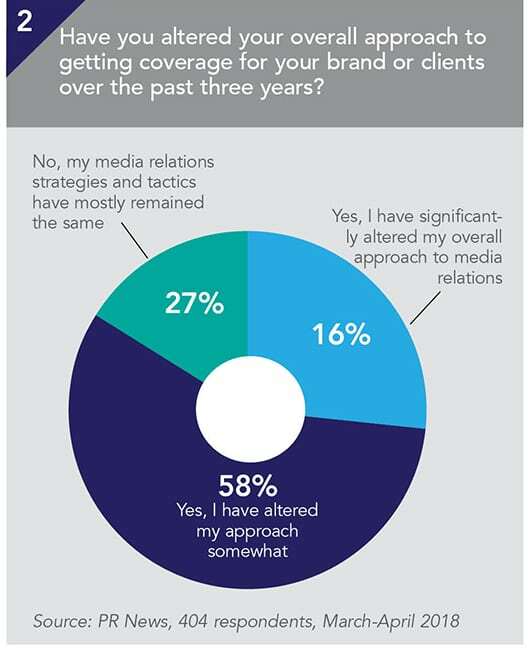 Nearly one-third of respondents (27%) say their media relations tactics and strategies have remained mostly the same (chart 2). Looked at with a glass-is-half-full approach, things can seem hopeful. For example, nearly three-quarters (74%) of communicators “significantly” (16%) or “somewhat” (58%) have changed their approach to media relations. On the other hand, a sobering interpretation can be viewed with trepidation: 85% of PR pros have only “somewhat” (58%) or barely if at all (27%) changed their media relations tactics in the face of a significantly altered atmosphere. Stepping back into the sunlight for a moment, you can argue it might be a question of timing, ie, the respondents changed their media relations tactics awhile ago, so, no, they've not recently changed things and answered accordingly. In other words, this group effected changes in media relations tactics years ago, when digital technology and social media were beginning to trend, so they're off the hook to change today. What do you think? Do your media relations tactics need a healthier diet and more exercise or did you adopt good eating habits and a vigorous workout routine years ago? Do you agree with pitching guru Michael Smart, who believes the plethora of digital tools and social channels make pitching and deciding whom to pitch easier than ever? He also thinks, though, technology can be a crutch: “Most PR pros don’t actually take advantage of the new avenues for success...almost everybody in this business simply defaults back to the same essential process their predecessors used...blast out a news release to a big list of media and hope for a response. The only innovation is that today’s generic pitchers use email instead of blast-fax software."